Bizerte is an enigma in Tunisia, as many will tell you it’s both the oldest city in Tunisia and also possibly the least Tunisian in terms of History both recent and ancient. 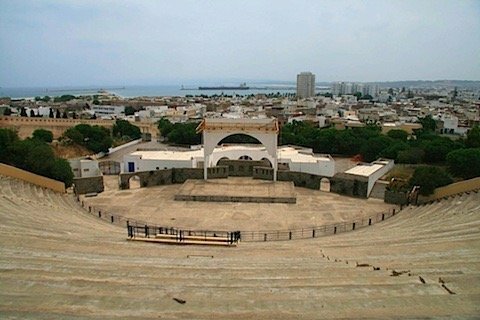 Bizerte is a small city of under 200,000 people though this is enough to make it the 5th largest in Tunisia as a whole. However, do not let its size fool you. It’s a lovely city in a fantastic location rich with history which is why it’s essential that you include it in your visit to Tunisia or indeed as part of a sail around the Mediterranean. Bizerte used to be a rather difficult trip from Tunis, given the single lane road to and from the capital. However, this has now changed and you can either go via the winding old road (avoid during wet weather) or use the relatively new toll motorway. This reduces the journey to a safe-as-you-like 35 minutes (Tunisian driving) or 45 Minutes (English driving). 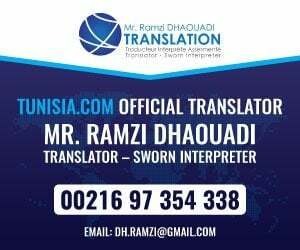 You can also get the louage from Tunis, the bus which will drop you in Zarzouna (the other side of the bridge ), or the train which will drop you off 10 minutes walk from central Bizerte. The first thing you may notice about Bizerte is that it feels different to other parts of Tunisia. Its wide coastal roads and green hills are reminiscent of southern Italy or even some parts of Spain. You definitely get the feeling that this is a good place to grow crops and fish, which probably explains why this is the oldest settlement of civilisation in Tunisia. You can almost see the Phoenician settlers sailing from what is now Modern Lebanon, discovering this place and thinking what a good home it would make. It had everything they were looking for. Sea – check, hills – check, forest – check, wetlands – check, lake – check. Add in the naturally defendable position and you have the feng-shui for the ideal ancient town. Assuming that you are arriving in Bizerte by road, you will come via the bottleneck which is the bridge into Bizerte. (Bear in mind that this can be raised at 3pm and causes many delays). As you go over the bridge, make sure that you look down the large canal and see the industry and buildings on either side of the water. Also note the impressive minaret on the mosque on the opposite side of the canal from Bizerte which is in a town called Zarzouna and is not to be confused with Bizerte itself. If you do find yourself waiting for the bridge, believe me it’s better to turn right after the bus station and head down the side of the canal where there is a café from which you can patiently watch everybody else getting stressed waiting. 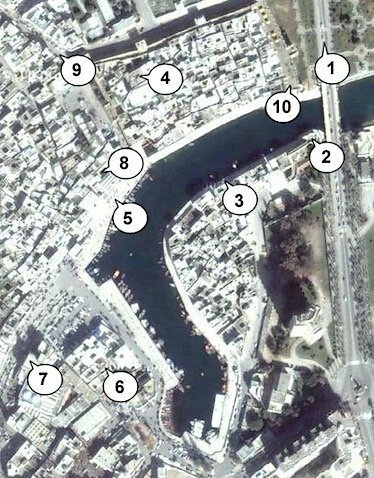 Bizerte can be a little difficult to navigate for the first time visitor and has many one way (interdit) signs. I recommend that you turn right after the bridge and take the nice, wide coastal road which gives you the space to think and time pull over if you see anything that you fancy stopping to see. 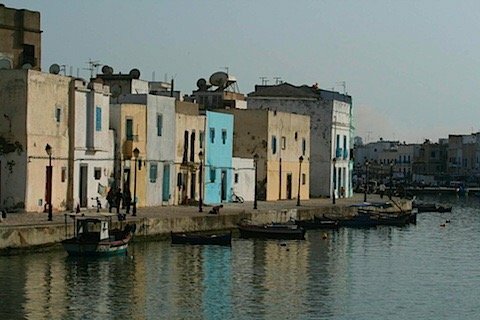 Bizerte is a port city and it is built right up against the sea. At the seafront of the city there is a wide mouth which provides a port which is currently only partly taken up with the modern marina. The industrial port is actually down the canal that you crossed over when entering the city. 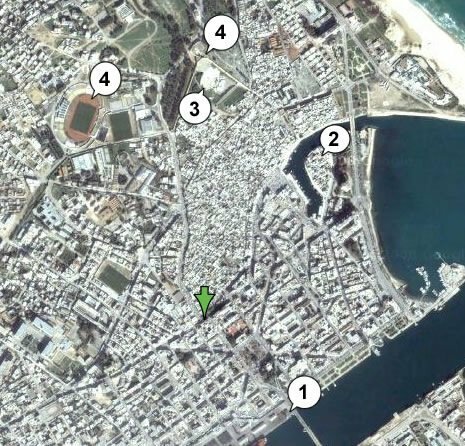 There are large changes coming to this part of Bizerte, which I will cover at the end of this guide. As you progress down the sea road you will come across a roundabout which will take you into the town. If you go left here, you can drive right into the heart of the Old Port. This is a good place to park the car as you can also walk down the seafront and over a small bridge across the entrance to the Old Port. This is well worth a look as it gives a great view of the entrance to the port. 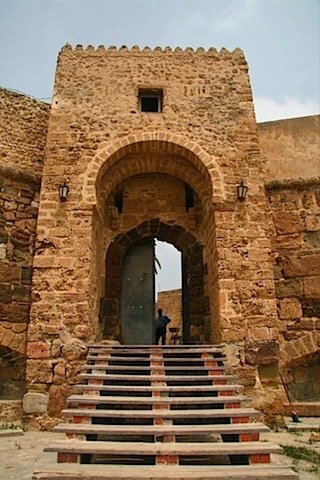 Once you enter the port, you will see a beautiful double Kasbah that served to protect the small city of Bizerte from all manner of invaders. Originally this route would have been the main form of access into Bizerte and the lake behind, but with the advent of increasingly larger vessels, this was superseded by the canal that you crossed via the Bizerte bridge. On entering the historic centre of Bizerte, you are immediately struck by the feeling that Bizerte has evolved over many years and is still a vibrant place today. The port is humming with fishermens’ cafés, traders and visitors to the main market, which is located behind the main row of buildings in the centre of the Medina. This is also a good place to park and have a break before more in-depth exploration of the town. A well-recommended café is the Marabout (lighthouse) which is on the left hand side of the port and is one of the “hole in the wall” cafés which serve the walkway to the port entrance. A nice ‘café direct’ should cost you about 750 millims (May 2008 prices) so you can also get a nice sandwich from Phantoms. There are also plenty of opportunities to buy some sweet doughy yo-yos and fricassee. Once you are recharged, your first choice should be to walk around the sides of the port itself and get your bearings. The port has been built up over the years and though often called Turkish, many of the parts near the front are from the time when Charles V was ruler of Bizerte. 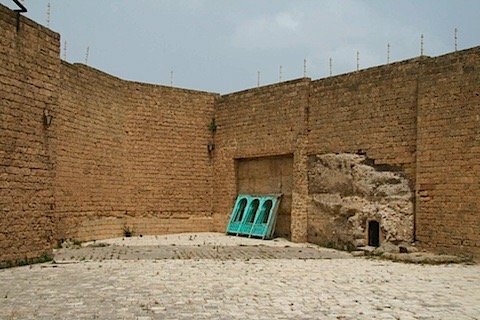 If you walk up the main Kasbah (on the right as you look out to sea) you can enter the ramparts for 500 millimes each and walk up onto the gun platforms which give a wonderful view of the seafront and also of the old Medina of Bizerte. The opposite wall, or Kisbah, also houses a café and aquarium. Unfortunately there is little in the way of information in these locations, so, if you are a history buff, it’s best to do your research beforehand. Standing on the ramparts, you can look out to sea and feel what it must have been like defending Bizerte and the fort itself in times past. It certainly saw some action over the years and changed hands a number of times. Looking behind, you can see the homes squashed next to each other in the Medina, the lovely minarets of the old mosques and the walkway to the market. 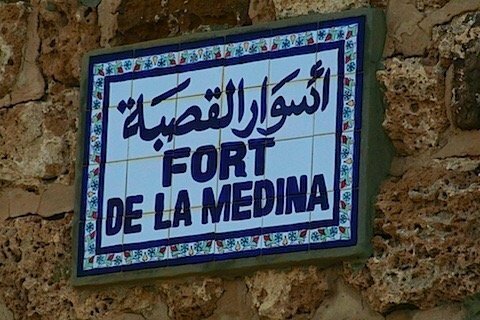 It shows that the Medina is really a town within a city. The inside of the city walls house the oldest part of the city. As you look opposite you can see some lovely houses near the other defensive walls. Work your way around and you can see the houses and buildings which date back to the times of the French rule in Bizerte, with their ornate balconies, many of which sadly need a little TLC but still retain their charm. There are plans to renovate the old buildings and there is also an association for the safeguarding of the Medina, which I hope is supported. This should protect the historic buildings, some of which are currently being altered in a none too complimentary style. However, this is the difference in Bizerte. It is not a museum and people continue to live and work in this place as they have done for hundreds of years. Keep an eye out here for young boys taking a high risk by jumping from the sides of the Kasbah into the water. Once you have seen the port area, our next stop is the Medina itself which I recommend seeing during the daylight to avoid getting lost in the warren of alleyways. 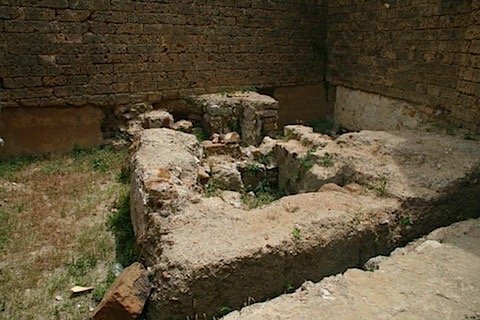 It is said that all the old families of Bizerte have their roots in this area. As you walk under the arches in the medina walls, your first must-see building is the old Mosque. 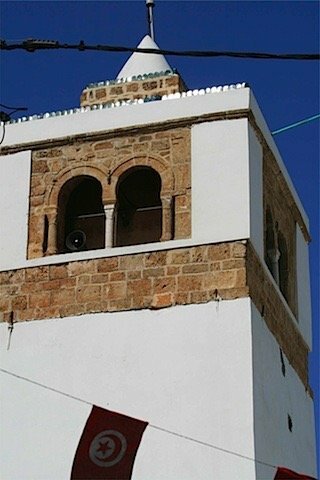 It is the oldest mosque in Bizerte and it has been recently restored. Inside the mosque there is a warm, cosy design, which is still as popular as ever. On Fridays this mosque is very busy. Be warned, you do not want to get trapped when the faithful worshippers exit in their droves as the exits around the mosque literally become packed. 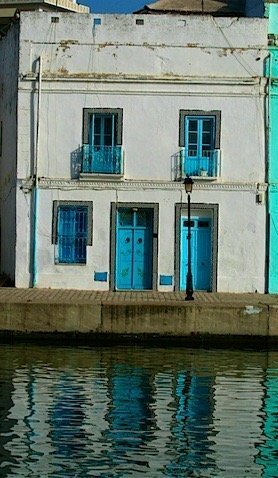 The Medina, like the port, is a living breathing place and houses continue to be built and added to even to this day. Unfortunately there is little open to the public in the Medina as the majority of buildings are private homes, but I find it fascinating to see that people are still living here, although the more affluent families have relocated to houses outside the old city. As you exit the Medina, head for the other mosque in the port which is the Great Mosque. This is also very old and, at the time of writing this guide, it is undergoing renovation. 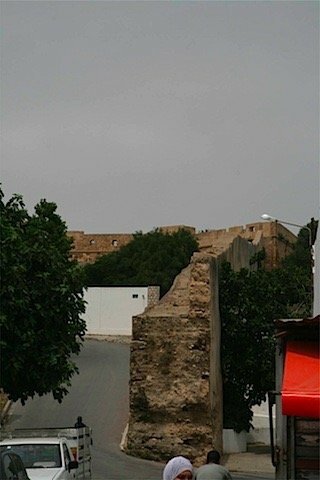 To the right of the Mosque entrance is the office of the Association for the safeguarding of the Medina. It is worth a visit even if just to see an example of the inside of an old building with its wonderful ceilings and tile work. You can now choose to either wander into the narrow back streets full of workshops and hole-in-the-wall shops or turn back and head towards the main shopping street and the market itself. The market is a lovely example of an old town retaining its importance. It is located behind the large coffee shops that line the waterside in the middle of the port. You can either enter the market via the steps behind the large mosque in the centre of the port, which takes you to the fruit and vegetable section, or enter on the other side, on a street that has more fruit and vegetable stalls. This entrance leads into the famous fish market. The market offers a fantastic selection of produce and it feels vibrant, especially on the weekends. You can get all your food here and can buy a variety of things from the shops that line the road behind. It is worth having an Arabic speaker with you to make sure you get the best price. The fish market in particular is fascinating, even for someone like me who doesn’t love fish! It is not so much the variety as the sounds and smells. If you raise your eyes, you can see the tiles and artwork above your head that for years has shown the customers the available products. Once you have finished in the market, walk down the road which has shops lining it, keeping the large mosque to your left. This road has a mixture of buildings from the colonial period and an eclectic mix of newer additions, which, although sometimes scruffy, provide the shops that are still popular today. There are a number of tourist shops here where you can buy popular souvenir items and also one shop that seems to sell nothing but eggs, which is something that I have never seen before. When you come to the end of the road, it opens up into a little square with a couple of cafés, a good cake shop for coffee and a cake along with a internet café (my brother-in-laws!) and a sweet shop. There is also a good sandwich shop over the road, directly opposite. 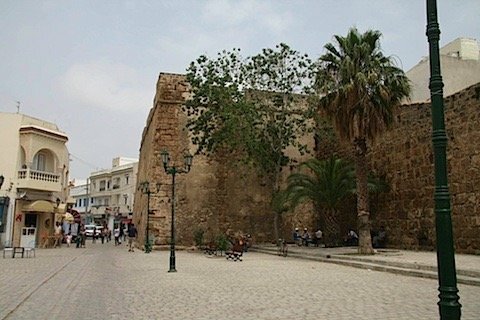 If you choose to cross the road you will enter the more modern area of Bizerte centre. If you take the road to the right you will be taken to the main square where you will find the town hall of Bizerte, which is opposite a park. The bridge can be seen at the far end. If you stand in front of the town hall and look to the left, you will see what looks like a hanger which is where a large church once stood. This is the main administration area of Bizerte and is the location of some lovely French buildings. Once you have finished here you can head back into town for some further exploration and a bite to eat. 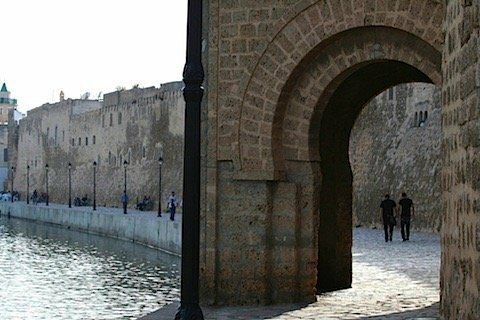 For most visitors the Old Port is the first and last place they visit in Bizerte, and this is a bit harsh as there are a few other things to see before you head back. 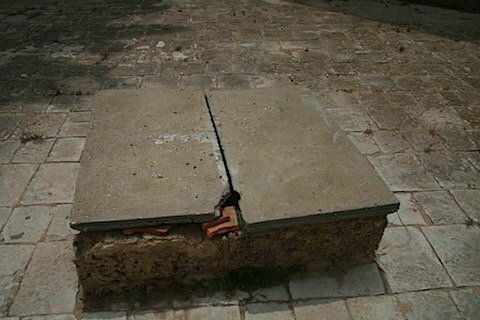 Head into the Medina, but do not go inside the wall. Head straight down, keeping the wall to the right and the small square to the left and you will come to the bottom of the old wall of the “Fort Espanola” or Spanish fort as the locals call it. Ironically I was later to find out that the fort was not completely Spanish as it was in fact mainly constructed by Algerians immediately after the forces of Charles V left, so maybe Fort Anti-Espanola would be a better name! If you have the energy it is worth walking up to the fort, either up the side or through the theatre, which is not as old as it looks. It forms a dramatic set of steps up to the fort itself. If you find walking hard or are a little lazy you can get to the fort via the road which runs behind it. 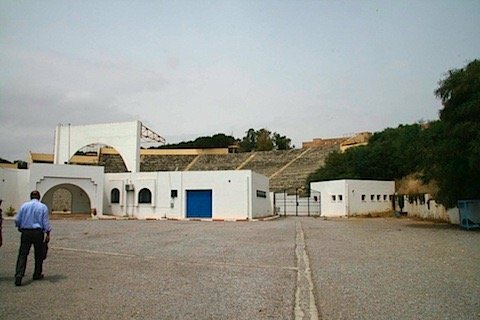 This theatre is the home of the famous Bizerte festival, which apparently started in the old fort itself and has grown to such a size that it attracts acts from all over Tunisia and the Arabic Music World. Head up the steps and you have arrived, so enjoy the view! As you enter the fort there are a couple of old guns which look like they may have been made in Italy. They stand abreast of an impressive door which leads into the small fort itself. The fort is small and only takes a few minutes to fully explore but the views are excellent. The walls are in very good condition, a testament to the quality of work that went into making this building. 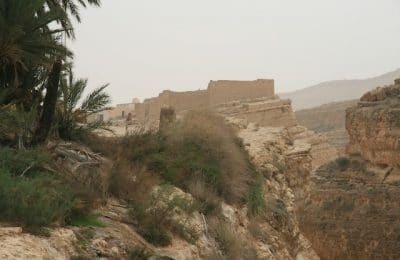 After you have finished taking in all of the scenery you can either leave via the back of the fort and head to the left for the centre of town or go back down the steps to the old town. At the top of the town is the large cemetery dedicated to those who lost their lives during the brief but violent battle of Bizerte with France. The gates were closed for lunch when I went to visit, but it is a lovely quiet place. It is advisable to get a cheap taxi up here or drive, as it is quite a walk up at the back of Bizerte. Though not the San Siro or Maracana, the ground is an attraction for football buffs and provides a nice view of the town below, as it is so high up. 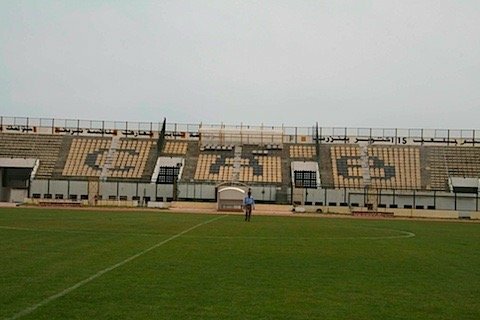 Going to football games is an experience in Tunisia. Ask before you go, as they can get a bit excited in the wrong kind of way from time to time. Make sure that you sit in the seated section unless you have local football-mad friends from the town who will look after you. For those who want to know, the ground holds about 13,000 fans, although it looks like more can probably squeeze in. The Corniche/La Grotte This is the part of town that follows the coast around and is considered the most expensive part of town. You know when you are in the Corniche proper as you see a roundabout with the famous plastic dolphins and a large safe behind of the same name. 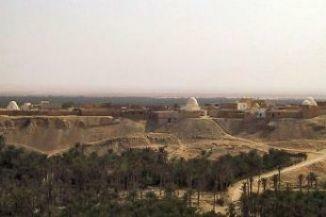 The land here is built up with large houses, mainly owned by rich Tunisians and ‘Chinoo’ which means outsiders. This is a derogatory name for those, especially young Tunisians, who live abroad and lord it about when they visit for the summer holidays. The Corniche forms a circle called the “route panoramique” where the front overlooks the sea and the back rises up so you can see over the houses below. The route is like a circuit and is treated as such in the peak season, as cars frankly go far too fast, so take care when walking here. The front of the Corniche is a nice walk and is where you can enjoy relaxing. You can also go down to the sea from the front but the beach is very rocky and lends itself better for walking than relaxing on. In the Corniche the majority of shops and facilities are at the entrance, and the farther parts are mainly residential houses. At the entrance to the Corniche you can find cafés, a supermarket, Bizerte Quads Tours (famous and mentioned later in this guide) and also Hajer’s lovely Internet café (shameless plug!) which opens mid-June, and is to the left of the roundabout. If you have time you can walk through the middle of the Corniche, which is a maze of houses and also through the top which goes right into the forest at the top of the hill. For a place with so much land and seemingly little in the way of construction, prices are very expensive in this area for houses and land. Prices start at around 80 dinars per m2 for land with no housing permission, up to 280-300 dinars per m2 for land near the road with no views. For those of you wanting something overlooking the sea, you are talking of prices possibly up to 1000 dinars per m2. It seems like the credit crunch has yet to tame these crazy prices! 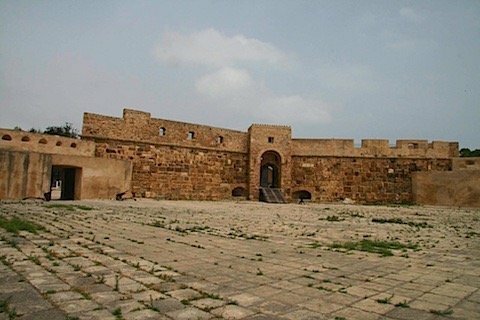 Ironically, during the Battle of Bizerte much of the population of Bizerte became temporary refugees here when it was nothing but fields. Many residents now in their 50’s and 60’s bought and built houses here, including my father-in-law, my hairdresser and many others. However, for the next generation the prices are far out of reach of all but the most wealthy. If you go around the Corniche you will come to a roundabout with a military station. Pass this and you will come to la Grotte, which is a lovely place. It is the next place to be populated, albeit often without permission. La Grotte is near Cap Blanche, which is the nearest point between Africa and Europe. The bay here is lovely and you can see why folks want to have houses here as the views are fantastic. If you follow the road through La Grotte you come to a place called Park Nadhour which is nice for pizza and kids will enjoy the small zoo here. Otherwise you can simply turn left here and go via the back roads back to Bizerte, or head back to where you came from. If you have the time, a must-do when you are in Bizerte is to hike or tour around the countryside. Bizerte’s region is simply beautiful. Even my wife was surprised at how lovely the countryside around her town is! In the hills around Bizerte there are a number of lovely vistas, forests and caves which need to be explored. 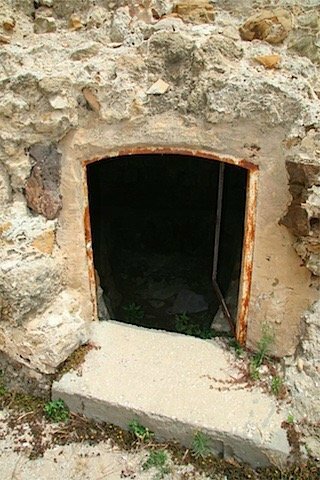 There are also secret beaches, war posts, tunnels and mystic places that make it well worth your while to explore. One of the best ways to do this is via a quad, or take a guided hiking tour to avoid getting lost and missing the best bits. The most popular tour company is Bizerte Quad, based on the road into the Corniche. I will be showcasing them and hopefully taking some photos within the next few weeks. If you are heading to Bizerte beforehand, then simply visit their office and see the choice of things to do and the many tours they offer, taking in the places mentioned. It makes an excellent day out for all the family. There are a number of hotels and restaurants in Bizerte but not as many as in the more touristy parts of Tunisia. If you are adventurous, you will find that food here is much cheaper than in Tunis. If you like you can add comments and recommendations to this page as there are always things we miss or we can add in for other visitors to the site. simply register via the login on the bottom of the navigation menu and you can add comments to this page and many others on the website.